Merry Christmas from Hidden Trails! It has been a while since our last Newsletter in August. Much has happened since. We have now updated our trips with 2010 rates and dates (98% of all trips). You can also see a list of all new trips online for 2010. We are very excited about our new “Create your own Brochure” option on our website. While browsing, you will be able to “ADD Trip to Print Brochure” ... it will be added to a “shopping cart” . When done ... just click on the shopping cart. Here you have the opportunity to add more trips or just print to a PDF file and save it to your computer for printing or viewing. This will eventually replace our Print Brochures in an effort to “Go Green”. We should have the new brochure option available online in the next days, so have another look on next Monday ! If you select a lot of trips, be prepared to wait a few minutes for the PDF brochure to be processed. On a recent visit to Chilko Lake (host of our Chilko Explorer Ride and Chilko Wilderness Pack trips) my wife and I experienced something very special. I have been to Chilko Lake many times in the past and know it very well - after all it is one of our premier riding destinations - but this time the experience went beyond even my expectations. First we decided to visit after the official season had already been closed - we went to celebrate Canadian Thanksgiving on Oct.12. So we were not able to fly in as most of our clients do, but had to drive. It was a wonderful drive, but it took close to 10 hour vs a 1 hour flight from Vancouver. We arrived in the evening just in time for a quick dinner. We were shown to our room and what a surprise it was. Chilko has always been one of my favorite places, but accommodations were always basic ... nice enough with private bath ... but basic as it very remote (4+ hrs from the closest town of Williams Lake). Our room was spectacular with a nice little gas fireplace, spacious and nicely decorated. And when we woke up the next morning - the view from our room was extraordinary. A breathtaking vista over the snow-capped mountains and the Chilko River - we just stood in awe for a while. But wait it got better. The lodge always had a nice ambiance and I have many wonderful memories, but recently Karen, our host, had expanded and totally remodeled the facilities - it is now one of the nicest lodges I have been to - and I have seen many on my travels. Most leafs had not changed colors yet and temperatures were still mild enough to go for a great ride and chase some horses - exhilarating. But wait - here comes the best ! 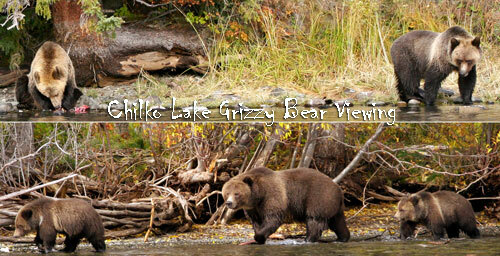 In 3 days we saw 18 wonderful, big, shiny, gorgeous Grizzly bears feeding along the river banks. It was like in the movies. One large bear was standing in the middle of the river grabbing some of the salmon that had recently spawned and died (one of the 225.000 this year). Others were just roaming the shorelines in search for their food to fatten up before winter sets in. A spectacle we will never forget. Sure I have seen bears before ... but this was really special and up close ! For 2010 we will offer some special Grizzly Bear viewing trips in late September and early October - sign up early - we will only take 6 participants at a time. On the last day it snowed 3 inches overnight (the first snow), so we had an exciting drive out in the snow - a bit unexpected and it took us an extra 2 hours to get home - but both my wife and I were very happy. as always we have a special page for "Special Offers" - there are some excellent deals available if you act quickly ... they will not last. Your can now follow us on Facebook and Twitter .. or stay in touch with the latest updates and subscribe to our RSS Feed.